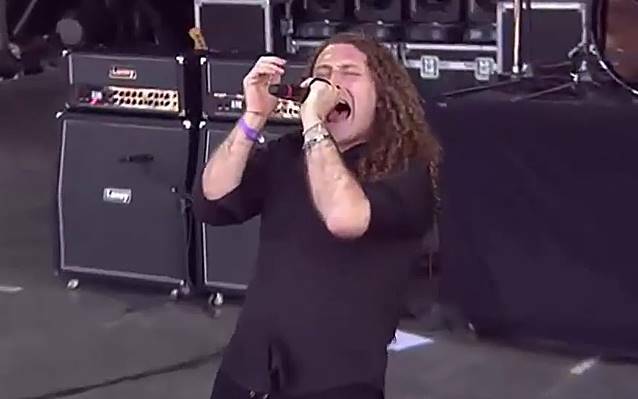 Professionally filmed video footage of Brazilian/Italian metallers ANGRA peforming at this year's Hellfest, which was held June 20-22 in Clisson, France, can be seen below. ANGRA's current lineup includes acclaimed Italian vocalist Fabio Lione (VISION DIVINE, RHAPSODY OF FIRE, KAMELOT). The band celebrated the 20th anniversary of the release of its 1993 debut album, "Angels Cry", with a special concert on August 25, 2013 at HSBC Brasil in São Paulo, Brazil. As a means of celebrating its successful trajectory, the band took the opportunity to schedule a small tour through Brazil and Latin America, which culminated with the show in São Paulo, after 11 dates. If there was any aura of uncertainty towards the future, ANGRA shook it off for good with a very special concert, truly a night to remember. As guitar player Rafael Bittencourt put it, "For those who think we should quit, I tell you: we're just getting started". That pretty much summons up the very apparent joy that the band showed onstage, not only that night, but on the whole tour. A stellar team of guests made everything even more special. Tarja Turunen, formerly of NIGHTWISH, lends her talent and angelic voice on two songs: "Stand Away" and Kate Bush's "Wuthering Heights". On the latter, the legendary Uli Jon Roth (SCORPIONS) is also featured, and shows why he is such a reference for the majority of guitar players around the world. The Brazilian string quartet FAMILIA LIMA appears in three songs, and drummer Amilcar Christopharo, from the band TORTURE SQUAD, grabs the sticks on "Evil Warning", representing the metal bands from Brazil. "Angels Cry 20th Anniversary Tour" was released as a separate DVD and a double CD, containing over 20 tracks in total and extra behind-the-scenes footage captured during the latest tour.